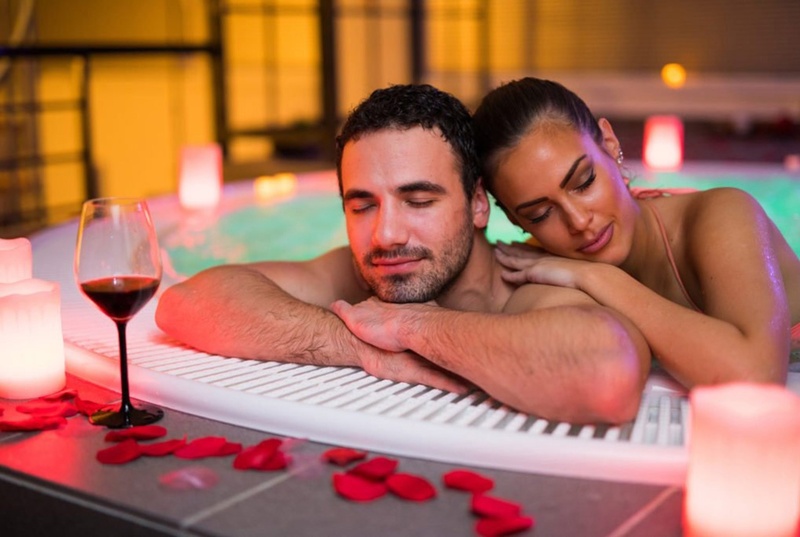 Hotels with jacuzzi are guaranteed to spark a flame of love and passion between couples…all the more so if it’s an exclusive location where you can relax on your own, oblivious to the outside world. Shedding your day to day cares and relaxing while taking a romantic dip with the love of your life is one of the most enchanting things you can do together. This is no normal bath but one with jets of bubbles in your hotel bedroom, where you can savour unforgettable moments entirely removed from it all. But make no mistake, long-haul journeys are not necessary: the most exclusive and luxurious hotels are to be found right here in the Balearic islands. And best of all is that a romantic weekend does not need to be planned ages in advance; it can also arise spontaneously. A unique candlelit experience amid fragrant aromas and fresh fruit…Let yourself be seduced by these stunning venues and have glasses of champagne at the ready, because here are the most attractive hotels with private jacuzzi. Close your eyes and feel the gentle sea breeze. Nestling in Alcudia bay is Hotel Vanity Golf, an authentic gem in the Adults Only category. It is located right next to the beach with some stunning views of the Mallorcan landscape. Vanity Golf is a true oasis of relaxation; the light and spacious bedrooms will make you feel right at home. Everything you need will be on hand, so you’ll only need to think about making yourself at ease, and asking for your wishes to be fulfilled to make this a super special stay. A jacuzzi on the balcony is an ideal way to immerse yourself in a relaxing bath of bubbles with your partner. Picture the scene: both of you in the jacuzzi while soaking up unique views of the sea; apart from a unique sensation it will be an experience with your loved one that you’ll never be able to forget. An exclusive jacuzzi with hydromassage, a bottle of bubbly waiting to be opened and burgeoning romance: welcome to Vanity Suite& Spa! Enjoy a dreamy weekend at this exclusive hotel for adults. The Vanity Suite & Spa hotel is located at the heart of the unspoilt nature of Cala Mesquida. It’s just a few minutes from the beach of fine sands and crystal clear waters that bears its name. It’s ideal for anyone wanting an exclusive and peaceful setting for their holidays. The bedrooms offer you all the comfort that you need: stylish furniture, spacious bedrooms, balconies with sun beds enabling you to relax while soaking up the stunning vistas and a luxurious jacuzzi…all creating a perfect setting for a pair of lovers. A pure pleasure! Give your partner a special gift with a romantic weekend at one of the beautiful Vanity Adults Only Hotels, with a unique stay at the heart of paradise. Find the one best suited to your tastes and spend an unforgettable time in a romantic hotel with a jacuzzi the bedroom.